KENYA. As the Kenya presidential race enters its final lap both President Uhuru Kenyatta and his main rival Raila Odinga are bent on wooing swing votes as they consolidate their strongholds. The Kenyans will go to the polls on August 8 to vote for a new president. Although latest opinion polls have suggested a runoff, both NASA and Jubilee are pushing for round one victory and both candidates are taking no chance in ensuring that voters in their strongholds turn out in large numbers to cast their votes. 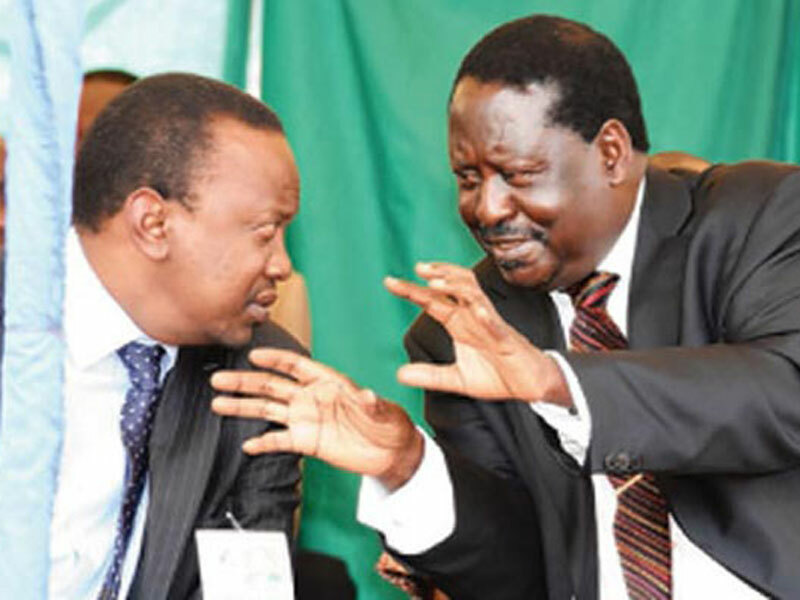 Kenyatta and Odinga are battling out for Narok, Bomet, Narok, Kisii, Meru and Tharaka Nithi, six of the 13 swing counties, that have become centres of intense political activity as the two presidential hopefuls jostle for the top-most position in Kenya. In the previous election, Odinga won seven of the sub-counties while Uhuru bagged six. Kenyatta beat Odinga in Isiolo, Mandera, Kajiado and West Pokot, among others. Odinga on the other hand beat Kenyatta in Nairobi, Turkana, Samburu, Trans Nzoia, Wajir and Narok. In total, Odinga won 27 of the 47 counties. NASA strategists claim the counties where Odinga won in the previous election had a total of 8,373,840 voters, compared to 5,977,056 in the 20 counties won by Uhuru. The strategists claim Odinga was let down by turnout.The counties won by Odinga registered a turn out of about 83 per cent compared to counties won by Uhuru that averaged 89.7 per cent. At the same time, where Uhuru won, he won big, averaging 86 per cent of the votes. Odinga’s average vote share in the 27 counties was a mere 70 per cent. Odinga’s campaign team snakes through a crowd of NASA supporters. 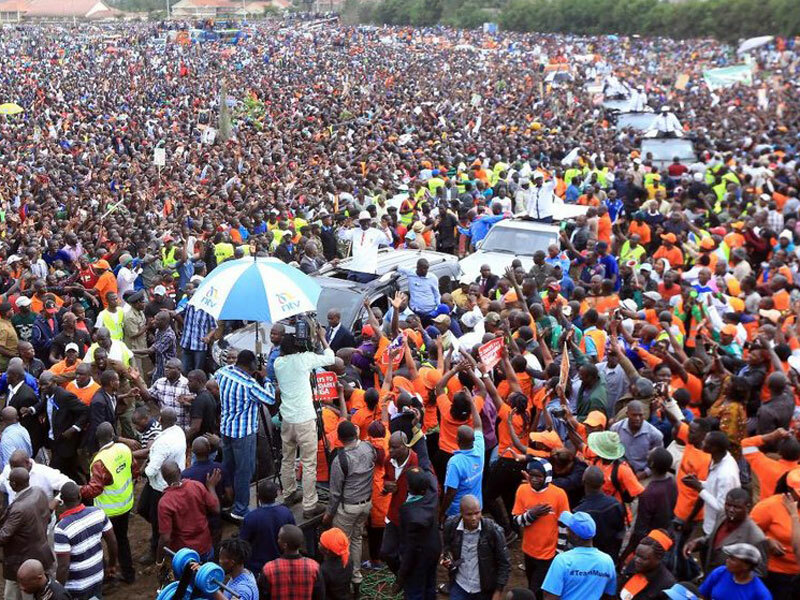 In what has given birth to the controversial slogan “10 Million Strong”, NASA says if the 2013 voting patterns are maintained, the counties won by Raila currently have 10,547,913 registered voters, compared to 7,556,609 in the counties where Uhuru won.This implies that Odinga’s chances of unseating Kenyatta are hinged on turnout. “The overwhelming reception we got from those two areas shows the ground has shifted in our favour,” said Raila yesterday. 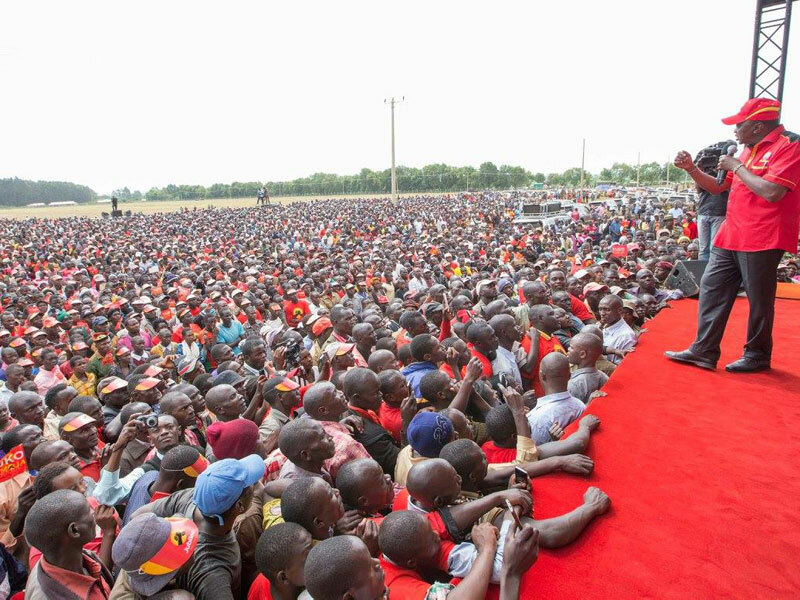 Uhuru is expected to head to Meru this week to try and undo any gains Raila may have made while the latter is expected to head to head to Western Kenya to seek to do the same in the wake of UhuRuto’s campaign tour of last week. Once considered to be a Jubilee stronghold, recent developments in Meru have alarmed the ruling party to the possibility that Raila could be penetrating the region. The NASA Coordinator in Tharaka Nithi, Prof Isaiah Kindiki, said the region is tired of Jubilee’s empty rhetoric when the people are wallowing in poverty. However, a recent opinion poll by Ipsos paints a different picture. Released on May 30, the poll indicates that Uhuru would win the Eastern region, that also includes NASA running mate Kalonzo Musyoka’s Ukambani turf, by 51 per cent with Raila securing only 36 per cent of the vote.